The coming collapse of the development system? Complex societies collapse because, when some stress comes, those societies have become too inflexible to respond. In retrospect, this can seem mystifying. Why didn’t these societies just re-tool in less complex ways? The answer Tainter gives is the simplest one: When societies fail to respond to reduced circumstances through orderly downsizing, it isn’t because they don’t want to, it’s because they can’t. In such systems, there is no way to make things a little bit simpler – the whole edifice becomes a huge, interlocking system not readily amenable to change. … Furthermore, even when moderate adjustments could be made, they tend to be resisted, because any simplification discomfits elites. There is obvious and direct relevance to the development system (thanks to @ryanbriggs for making this connection). a group of people, through a combination of social organization and environmental luck, finds itself with a surplus of resources. Managing this surplus makes society more complex—agriculture rewards mathematical skill, granaries require new forms of construction, and so on. Early on, the marginal value of this complexity is positive—each additional bit of complexity more than pays for itself in improved output—but over time, the law of diminishing returns reduces the marginal value, until it disappears completely. At this point, any additional complexity is pure cost. This is an almost perfect description of the aid system as experienced on the ground by developing countries. (I have often wondered if the common empirical finding of diminishing returns to aid is in fact the result of diminishing returns to the number of donors.) We have more and more donor agencies (the UN has more agencies working in developing countries than there are developing countries). The burgeoning number of donors impose more contradictory conditions, add transactions costs, drive up the price of scarce resources, and coordination costs grow exponentially. There is, however, one element of complex society into which neither markets nor democracy reach—bureaucracy. Bureaucracies temporarily reverse the Second Law of Thermodynamics. In a bureaucracy, it’s easier to make a process more complex than to make it simpler, and easier to create a new burden than kill an old one. A few weeks ago, the country heads in Ethiopia of the European aid agencies met to discuss how they could simplify their work. It was triggered by a letter of 4th February 2010 from Stefano Manservisi, the Director General for Development in the EU, to the heads of European aid agencies calling for them to agree a “division of labour” in Ethiopia. Of course, the meeting was an expensive flop: each donor showed up fully briefed to explain why it is essential that they continue to be involved in every sector. * Rather than streamlining their operations, donors have begun to discuss new layers of complexity, such as the designation of “lead” donors, “focal points” and “silent partners”, so that they can continue to operate as now but under the pretence of greater specialisation. This was entirely predictable: the bureaucratic and political need to be involved in many sectors in every country is a far more powerful force than the intangible development benefits of simplification. Where there is a clear need for more simplicity – such as in the delivery of health aid – the system is unable to merge or close institutions, to reduce the number of donors and simplify the way aid is delivered. Instead our response to complexity is to add yet more layers and institutions, such as the International Health Partnership. Apparently none of the participants sees the irony of creating a new global partnership to tackle the problems caused by the existence of too many global health initiatives. As Tainter predicted: it is easier to make a process more complex than to make it simpler. Senegal has 82 individual aid co-ordination forums. Here is another example. The rise of global health funds led to a collapse in the funding for health systems of developing countries. Instead of giving money to countries to enable them to build up their network of primary health clinics and to train health workers, money was channeled to the Global Fund and GAVI to buy medicines and bednets. PEPFAR would pay for brand new laboratories for AIDS, complete with lab technicians and doctors, while the next-door health centre could afford neither staff nor medicines. The results was a worsening of health care. How did the aid system respond? Not by reducing the money flowing to global funds and putting the money back into government health systems using the existing channel of the World Bank: in the meantime the global funds had become too powerful and the bureaucratic capture was too great for that kind of simplification. So instead these agencies have created a Health Systems Funding Platform, the purpose of which is to “… harmonize and eventually provide support through a joint system funding platform”. These agencies are now involved in a series of conferences and meetings to figure out to harmonize their work on health systems. It is obvious to everyone is that neither GAVI nor the Global Fund should be involved in this at all, but there is no way to get them out, or to shift their funding elsewhere, now that they exist. In 2008 and 2009 I took part in an OECD DAC “Strategic Reflection Exercise” to consider “how to sustain and increase the relevance of the DAC and its subsidiary bodies in the changing development co-operation landscape”. Given the changing relationship between donors and recipient countries, the rise of new donors outside the DAC such as China and the Gates Foundation, the proliferation of global funds, and challenges to the aid model, this would have been a terrific opportunity to chart a new course for the aid system. I argued that the DAC would remain relevant only if it underwent radical change, including expanding to include a much more diverse range of donors, becoming a partnership of donors and developing countries (and not merely a donor club), and taking on a stronger regulatory function with real teeth rather than just a talking shop with an ace statistical unit attached. Of course, the bureaucrats from the incumbent aid agencies were not willing to contemplate any of this. The resulting report consigns the DAC to oblivion in a changing world. Support for the aid system is beginning to haemorrhage; Dambisa Moyo’s book, Dead Aid, though it is poorly researched and deliberately misleading, has captured a public mood. More credible voices, like that of Andrew Mwenda, are speaking out against the aid system. Donors see China’s rise as an aid donor in Africa as a threat, and huddle together to wonder how they can bring China into their system. (Of course, neither China nor the Gates Foundation is remotely interested in joining the system that donors have built for themselves). * In case you are wondering, it was not somebody from DFID who told me about this. As much as I think a collapse would be helpful in the long run. I doubt it will happen. As a species we hate big collapses of anything and will do most anything to avoid them (the U.S. bank bailouts were an example of this.) I agree with Chris Blattman that the aid debate has gotten pretty stale, but I also agree with Easterly’s response to him that not much has changed because of the debate, i.e. a lot of important people are still in denial. In my own field (coastal management) the articles in the latest edition of the top CM journal are still spouting the same approach they have been for the last 20 odd years. Its depressing but in some ways I see it as a generational problem. Those who pioneered the development approaches of the last 20 years are still in power at the major aid agencies and aren’t really interested in changing. Justin – I understand your point of view. But I suspect that the combination of waning public support, frustrations in developing countries at the old way of doing things, and the proliferation of alternative models may drive change that is faster and more radical than those who are immersed in the aid industry currently recognise. Owen, you are spot on about the nature of this structural problem. And it IS structural. From being a bit outside the system for awhile at CGD, and now back inside….I can see how profoundly dysfunctional it is, while also realizing that all the actors are behaving in the ways that make sense from where they sit, with the organizational imperatives they face, and the info they have. Perhaps unfairly, I still place some blame on the high-level decision makers in the system. I wish I could believe that the waning public support, and frustrations in the countries, and appearance of new models would lead to radical changes………. I hold some hope that improvements in information flows will help at various levels. But these potential dynamics for enhanced accountability seems fairly easily manipulable. Whichever agency is willing to spend a lot on PR/ advocacy can easily influence popular perceptions in their favor. The Global Fund is very effective on this score. I think your ideas about how to turn this complexity into a pluralism that can support meaningful choice and competition at different levels should be much more discussed. Not sure how time consuming it’d be, but perhaps you could post a blog entry on each “level” of the aid system where you suggested new arrangements/ models in your “Beyond Planning” paper? I think it’d expose even more people to your ideas. Aid practitioners…as you know…often don’t have time to read papers. Also: as you indicate here, almost every problem the aid industry has, the health development assistance sub-sector has an even worse case. Why do you, and your readers, think that is? What is it about the nature of health programs and assistance that generates an even higher level of dysfunction? Enjoyed the post Owen. The situations in Tanzania and Uganda are similarly cursed. But I’m not holding my breath for real change to be driven by donors, regardless of added transparency and exposure about their antics. At best what may come is a variation of Paris/Accra, because the status quo works well for the interim interests of most donor staff most of the time (and 3 year contracts help ensure little learning and even poorer institutional memories). What one really needs is clear headed governments with leaders who are motivated and held accountable to make things happen, and who will put donors and their elaborate schemes in their rightful place. Now how one can contribute to that is the really interesting question. I sometimes think it would be interesting (if terrifying) to try and calculate how many expensive expat man-hours are being spent on donor coordination groups (at last count there were 30 of these such groups in Mozambique), where from my limited experience more time goes into sharing information about what each donor is doing, and creating complicated matrices, than actually dividing up the work. Rakesh may well be right about the incentives facing aid agencies being well entrenched. And the Moyo inspired backlash is probably much less than one may think. In donor countries, not too many people think about these things. Those on daily mail comments pages saying “it’s-all-being-stolen-they’re-all-corrupt-it-is-all-hopeless” have always been saying that I think. Whether motivated and accountable leaders can emerge in all contexts is debatable. In some places the overlapping interests between political leaders of all stripes, media interests and ‘civil society’ leaders – the elite, simply – depend on careful management of gullible donors and their elaborate schemes. And this can mitigate against anybody breaking away from the pack and really challenging the status quo. Which isn’t to say it can’t be done…..
Great post. You might be interested in an Aid on the Edge post on the broad theme of complexity and collapse in the context of the 2009 Copenhagen summit. That is a smart and challenging idea. Makes me think of work in organizational sociology when trying to understand the incentives of folks working within such a system. However, I think instances of “collapse” are quite rare. Equilibrium would seem to be more of the same inefficient division of labor. Makes me want to read the book. You are right about the proliferating number of aid organizations. 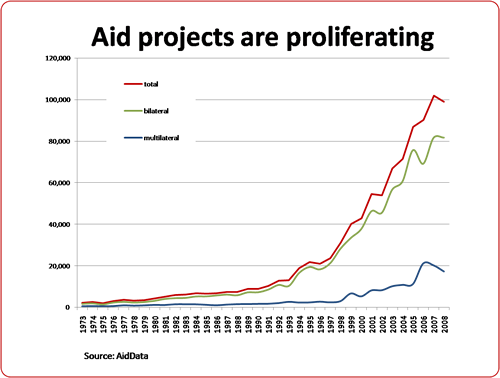 And I am not talking about NGOs or private firms that implement aid projects, though they are also likely proliferating; I am talking about the growth of more bilateral and multilateral aid agencies giving more and smaller projects. So far, we have identified and collected data on about 90 donor organizations that are directly (bilateral) or indirectly (multilateral) dispensing development finance whose ultimate source is the tax dollars of citizens in donor countries. We know of about 20 additional bilateral aid programs for which we have no data. On project size, there were two papers at the AidData Oxford conference last week that described and then attempted to explain this trend. Here is a link to the papers if interested. Fascinating article Owen, confronting the un-confrontable. ‘There are signs of coming collapse all around us’…because 3 books and 5 bloggers write about it?! The capillary system of aid is strong and powerful, keeping many bureaucrats, aid workers, academics etc in business-both in the ‘North’ and ‘South’. I’m playing devil’s advocat here, but I don’t care about Senegal’s aid coordination forums. Charities are thriving, tax payers’ money is flowing, academic courses around ‘development’ are growing and the expat lifestyle has never been more popular. Some of these dynamics may be changing with the rise of the BRIC countries-but then again I have been hearing this for years and domestic problems in these countries may become more important than a few billions spend on foreign aid. Don’t get me wrong: I am academic in the development field and I know about the debates and problems and that’s why I challenge the assumption that ‘the system’ is showing signs of collapse. I really don’t like the word…yes, there will be changes etc, but what would collapse mean? UN closing down? Oxfam being bankrupt? I find the original Shirky post quite uninspiring. A consultant who needs to be ‘provocative’ so he’ll be invited again. So where are examples of complex business model’s ‘collapse’? TV stations under pressure, ATT having problems with broadband? Well, TV and landlines will be around for a few more years…OK, AOL disappeared, but none of this is a ‘collapse’. Globalisation and complexity are a huge difference between Mayan time and ours. Ok, so NOBODY will buy a car ever again in the States in 5 years time. Big deal-but there will be Chinese and Brasilians who still will. Maybe big names will disappear or Detroit will become a ghost town-but is this a ‘collapse’? People are very quick in predicting trends from the end of Second Life to the beginning of the paperless office, but social, cultural and political shifts take much more time in our societies than in Roman times. And finally, there is a complex link between politics, economics etc. So the banking system was on the verge of ‘collapse’? Maybe-but governments decided to bail banks out. ‘Development’ has become an established cultural, political and economic system and if we think this system is on the verge of collapse, what must people in the 60s and 70s have thought about the world they were living in?? I am also skeptical about anything as dramatic as collapse given all the push in the development industry. I see the key strategy for reform as coming from the recipient countries. More aid recipient country simply have to say no to donors, to NGO’s and new programs and refuse to sign country agreements. India has quietly asked a number of bilateral donors providing insignificant funding to wind down their aid programs and now there are a manageable few operating in well defined spaces. The other option is that sponsors of global initiatives need to “vaccinate” against bureaucratic capture by setting time limits on initiatives. Even when global efforts start with a well defined mission and achieve that mission, they never seem to go away. Why did the donor community have to invent a new mission for UNAIDS? It had been successful beyond anyone’s expectation circa 1996 in raising funding and awareness for AIDS. Now it is just a bureaucratic holdover complicated the landscape with Global Fund, PEPFAR, national programs, etc. To some degree, the fragmentation of the aid system reflects the increasing multipolarity of the global public policy — and global power/governance — scene. The US has for a long time wanted to go its own way, having a privileged say in multilateral organizations or having their own aid mechanisms that don’t always partner well with other sources/channels. Europeans no longer want to fall in line under a US system, but are not unified among an EU group and are subject to their own national level domestic constituencies. Smaller traditional donors do not want to move under G7/G8 leadership, yet are excluded from the broadened global governance of the G20. The emerging market members of the G20 are not in a position to fill a global leadership vaccuum created by the fragmentation of power among the G7. Plus, the rise of international advocacy networks brings together sector advocates from all sides that want their own vertical funds. So, the postwar and post cold war political alliances are fragmenting, leading to more fragmented aid sources. Does this represent a global collective action failure? I am skeptical about the collapse: this would only happen if the primary institutional donors (mostly donor countries) bail out because they would find out there is something wrong. As they assess their system not on basis of the results for the poor, but along the lines of agreements that use proxy indicators like the Paris declaration (which is rather the source of the problem than the solution) they see participation in more coordination efforts and “flexible” thrust funds as an indicator of success, not as an indicator of failure. There is added value and instant gratification in it for a donor if he would choose for developing expertise and specialize instead of just joining the crowd. Belgium has put as a rule for its bilateral programmes to have maximum 2 sectors in a country. The effects on the impact are immediate. Also on the visibility of Belgium. Where it used to be a minor donor in every sector, now they manage to be a player in a few crucial areas of development. Fragmentation of the donors is only a problem if they do not specialize. If they would specialize and compete for effectiveness, a fragmented aid system is very much like a perfect market. The number of intermediary structures is because of a lack of fragmentation: nobody is “their own man” they are just part of a coordinated crowd. Where is the evidence that the Global Fund results have been a “worsening of health care?” It’s particularly odd to see the old “Global Fund bought bednets instead of health care workers” canard from somebody in Ethiopia, who must be at least casually familiar with the Fund’s support for training 30,000 health care workers there. Agree on the joint platform, though. What’s the point of “harmonizing” with the Bank when 75% of its health projects in Africa are unsatisfactory by its own criteria. JP asks a good question: “what is the evidence that the Global Fund results have been a ‘worsening of health care'”? It is a good question because it demonstrates my point very well. As you say, JP, the Government of Ethiopia has trained 30 000 health workers. This has so far been a remarkable success, and one of which the Government is rightly proud. The Government of Ethiopia knew exactly what it wanted to do, and it raised the money mainly from its own local revenues, plus support directly from donors and through global funds such as GFATM and GAVI. So what value did the Global Fund add? It took money from donors, took off some overheads (which are growing out of all recognition at the Global Fund), then delivered the money to the Government of Ethiopia alongside all the other money direct from donors. It got a seat at the table, took up some more time of Ministers and senior officials, and justified its existence by adding some more hoops to jump through. Then it claims this as a “result”. It is easy for almost any organisation to quote examples of things it funds, and say that this demonstrates that it produces results. Well that depends on what the alternative was. If the money would never have been spent on development, then it is fair enough to count this as a success. But if the money would alternatively have been used for development in some other way, then it is far less clear cut. The Ethiopian Government did not need the advice and support of the Global Fund for its Health Extension Workers scheme. There are more than enough donors here offering advice. (Indeed many of the donors now claiming to have been part of the success opposed the scheme at the outset, because they thought the health workers should have been given more extensive training). It would have been better for the money to have been given by the donors directly, without the overheads of the Global Fund and without the costs to the government of having to deal with yet another donor, than getting the same money via yet another organisation taking its cut and claiming part of the credit. So, to the question of the evidence of the harm done by the Global Fund – again, it depends what you think the alternative is. But compared to the first best alternative of the money flowing directly to the Ethiopian government, without the overheads and strings of the Global Fund, there is no doubt that the strings attached to Ethiopia’s health aid have imposed huge costs and inefficiencies. (See http://www.owen.org/blog/2717 for more details). I agree it’s not yet clear what the benefits of the harmonization efforts among global health funders will be. The underlying logic of harmonizing “toward” the World Bank’s support I believe is that it is typically focused more on health system strengthening than the funding which flows toward disease goals (e.g. Global Fund, PEPFAR, US President’s Malaria Initiative). You suggest that the World Bank’s evaluation results call into question whether their lead should be followed in harmonization. As Owen points out, it’s all about comparing existing options. The Global Fund evaluation, coming in at over 800 pages, was read by few. However, the findings were rather more damning than the World Bank’s. And especially so with respect to the effect of GF support on health systems. I wrote a brief synthesis of it on the CGD Global Health blog. What is not seen and given almost no attention is the different political agenda’s that drive harmonisation discussions. If global and national compacts are agreed, who are the players at the table? What are their interests? If they become the only partner to deal with, is a government that is highly dependent on foreign aid for running its basic services still free to make it’s own choices? Leave alone the citizens. If you look at the emerging international health partnership, it only got together when the DG of WHO changed. At that point enough progressive individuals were in the right place to take steps in pushing progressive population policies and roll out reproductive health services world wide. Maternal mortality numbers may decrease quickly as a result. However, what services are being offered requires a good domestic ethical debate. Otherwise the same mistakes will occur as in the seventies when major infrastructural projects came in without proper domestic consultation and approval processes preceding them. Interesting post. Collapse is not a menu item; it occurs for, as you imply, reasons beyond the direct control of people -including elites, who are among the least resilient when their resources are in decline. Look at role of energy in Tainter’s work and couple that with the diminishing returns thesis. Oil production appears to have peak several years ago and the world economy is contracting, which is a form of slow collapse -loss of complexity- not a sudden deep collapse. Sudden deep collapse is still possible, especially as oil extraction actually begins to decrease and we collectively refuse to downsize. Beyond a point the qualitative nature of a system changes; and that’s where we are headed because we do not as a culture see the connections between energy, economy, finance and politics.